From Louisiana’s remote bayous to its gilded cities, five startling stories of awakening by one of fin-de-siécle America’s most famous writers. Another reminder, after a few colossal misses, how important the Little Black Classics range is in introducing me to authors I’d never heard of. 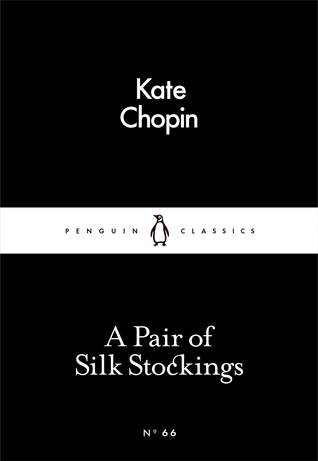 This is a collection of short stories from Chopin, with A Pair of Silk Stocking reserved for the finale. I enjoyed each in equal measure, excepting the penultimate tale, Nég Créol, which didn’t rouse me in quite the same ways. Chopin is a delight, though. Her stories are daring in fulfilling characters’ karma, and of describing the ways of life in nineteenth century Louisiana. A Pair of Silk Stockings is a tale of luxury, with Mrs Sommers finding fifteen dollars and, despite planning how to clothe her children with it, taking the money and spending the whole lot on herself, having a wonderful day which is completely out of the ordinary for her. It speaks of what women sacrifice for their families and how powerful it can be to have a treat, the power to choose for yourself, and time to spend only in your own head. Désirée’s Baby, Miss McEnders, and The Story of an Hour all told of situations where characters believed they had the upper hand, only to become punished by fate. This was particularly delicious in Désirée’s Baby, which was my favourite of the five. I would have liked Penguin to have used a different quotation for this one. Although I may have bias, as the chosen quote is from Nég Créol, I didn’t feel it quite covered the feel of the stories, and I’m sure there are many other quotes in the collection which could have served much better. This is an important addition to Little Black Classics for me, as it’s already prompted me to go out and buy more Chopin. New discoveries were my goal all along, and I’m absolutely delighted with this one.